Halloween Mini Sessions card template is a great way to say hello to families in your community. Use it for postcards and handouts. 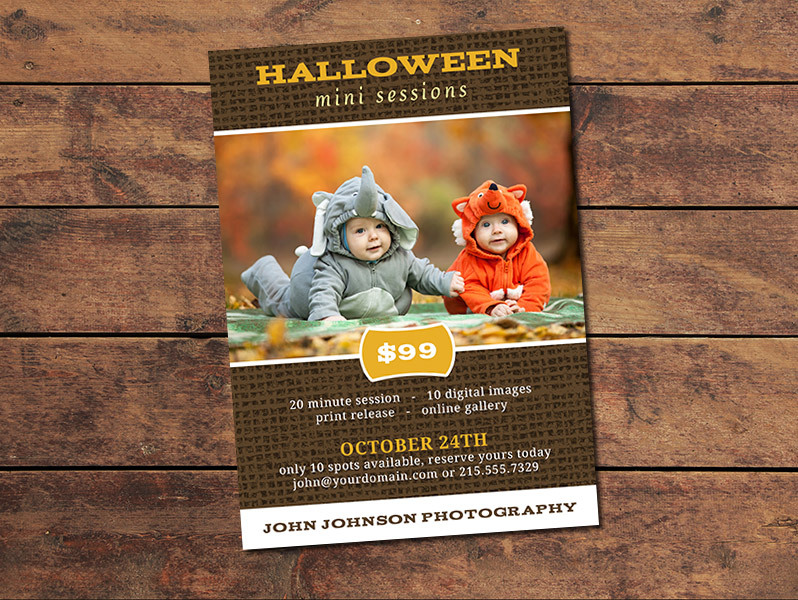 Halloween Mini Sessions Card is included in the Ultimate Photography Bundle! Promote your own Halloween mini sessions with this card template. Mini sessions can be a great way to boost your income, find new clients, and encourage repeat business from your existing clients. Photo by Saso Tusar, Unsplash. And of course, you can always upsell clients on larger packages or add-ons, like prints. This template fits a 5 x 7 single-sided printed card. Easily enter your own details and your photo to customize the card, have it printed, or use it online for promoting your mini sessions. Photo by Omar Lopez, Unsplash. Share it through your social networking profiles to get the word out about your mini sessions. Edit the template in Photoshop and Photoshop Elements. Photo by James Kresser, Unsplash. The template was designed to the specs of Bay Photo Lab but can be adjusted to suit the specs of other labs or printers if you prefer. Stock photos shown are for preview purposes only. They are not in the download. Due to licensing and copyright restrictions, fonts are not in the download. However, your download has a fonts.txt file with a font list (free to download), as well as the URL to download each font.